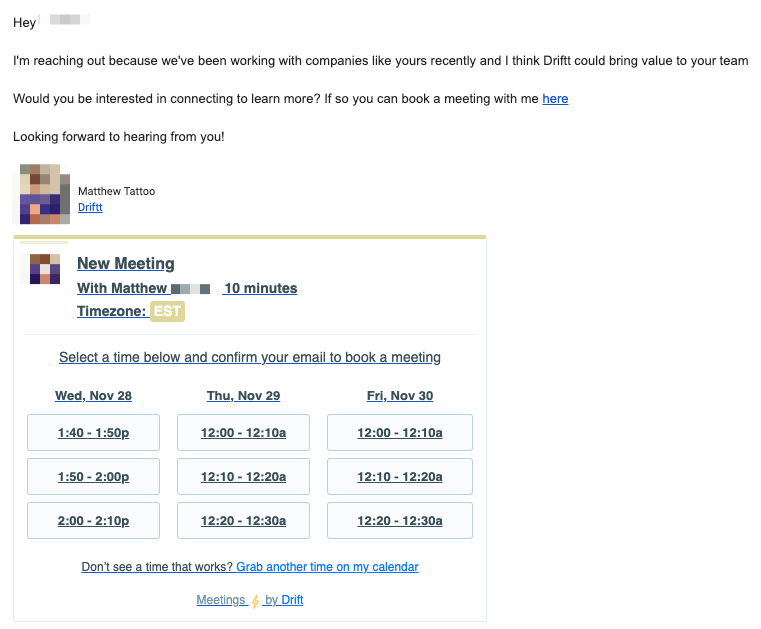 Sometimes, when emailing a prospect, you may not want to make them navigate to your profile to book a meeting with you. To reduce friction, you can include your upcoming calendar availability in an email with one click! 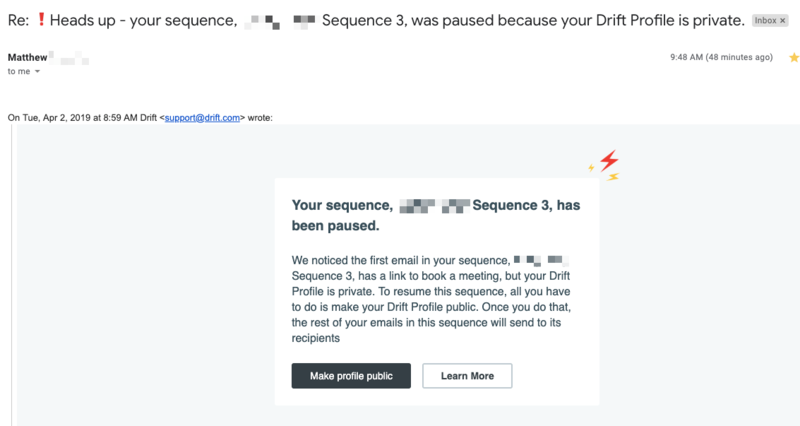 To do this, your Drift Profile must be public, you must have your calendar connected, and you'll need the Drift Chrome Extension! Please note that this functionality is only available for emails sent with Gmail. To connect your calendar, go here. You can connect either to a Google or Outlook calendar. For more information on connecting your calendar, read this doc. To find your profile, go here. When you've edited it to your liking, flip the switch to make it public! For more information on editing your personal Drift profile, check out this doc! To download the Chrome extension, go here. For more details on what you can do with the extension, read our doc! Once you have your calendar connected, your profile public, and the Chrome extension installed, you're ready to insert your availability into emails in Gmail. When composing an email in Gmail, either click Share calendar or click the arrow to choose from availability for your different meeting types. We'll show the first three available time slots over the next three days by default when using Share Calendar. When inserting availability from your different meeting types, you can choose to share up to three days worth of availability and we'll choose available times within those days. You can also choose to share availability in different timezones to make booking easy for your prospect! The recipient can simply click any time slot in the window to book that time and receive the standard confirmation email. The window shows your first three available time slots in the next three days, with the option for visitors to head to your Drift profile if they want to see more options. When composing your sequences, click Insert and select Next Meeting Times. We'll show the three available times with each of the next three days with availability. We'll send you an email notifying you of the specific issue.